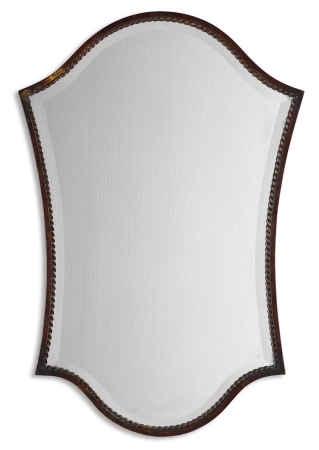 This simple mirror brings a quiet elegance to your wall with its slim metal frame and distressed bronze finish. Burnished details provide a dark tone to the piece that will look stunning against a variety of wall colors. The mirror measures 20 inches by almost 30 inches and would be a perfect fit for many single sink vanity areas. You could also use this as a functional mirror in a dressing room or bedroom space or add a bit of style to your living room, dining room or foyer. The mirror comes with brackets for mounting throughout your home. Love the mirror. It is very rich looking. I put it above the vanity in my small bathroom and it looks lovely. It adds so much to the room and isn't the average square mirror which really is unique. Nice doing business with you. Love the mirror. Delivered quickly. Pleasant follow-up from company. Found the mirror cleaning tips helpful and love the eco-cloth for cleaning. Thank you. Would order again from you. My mirror arrived quickly and safely and looks wonderful as it hangs. I appreciate the personal and most excellent service and attention to customer need. Thank you. We were very pleased with out mirror! Great quality and works perfect in our 1/2 bath. Would recommend you to friends for sure in the future! Thanks so much! Love this mirror! Needed a small mirror for my small bathroom. This was it. Really looks great. Lovely dealing with you. Quite a happy experience. Q: Can you tell me what the narrowest width is on this mirror? A: The narrowest part on this mirror is 16".